New Berkeley trattoria knows how to showcase the sunny flavors of September. 2826 Telegraph Ave. (at Oregon St.), Berkeley. 510-665-9601. LocandaDaEva.com. Cash, American Express, Discover, MasterCard, Visa. Open Tuesday, Wednesday, and Sunday 5-10 p.m., Thursday-Saturday 5 p.m.-midnight. Closed Monday. Reservations accepted. Noise level: medium. Those of us who love summertime are especially content during the warm weeks of September, the Bay Area's real summer, when beaches beckon, pennant races heat up, and farmers' markets are still abundant with berries, tomatoes, stone fruit, and sweet corn. It's the perfect time for firing up the grill, sipping a cool cocktail and gorging on the flavors and textures that won't be this luscious again until next July or August. What you want at a time like this is a restaurant that's as devoted to the seasons as a good Mediterranean trattoria, a place that knows how to showcase the sunny flavors of a chili pepper, a zucchini, a nectarine, and a bushel of blackberries. If the place also manages to evoke a sunny trattoria in the heart of Rome, so much the better. Locanda da Eva fits the bill. Open since late July and located in the same unprepossessing building that hosted the Casa de Eva Mexican restaurant for 37 years (hence the name), it's owned and operated by local food writer Robert Lauriston. (Full disclosure: Lauriston wrote some restaurant reviews for the East Bay Express in the mid-1990s.) He and partner-chef Huw Thornton (A16, SPQR) and partner-GM Matt Derrick (Terzo, Pesce) serve hearty, satisfying Italian cuisine accented with tastes and textures from throughout the Mediterranean region. 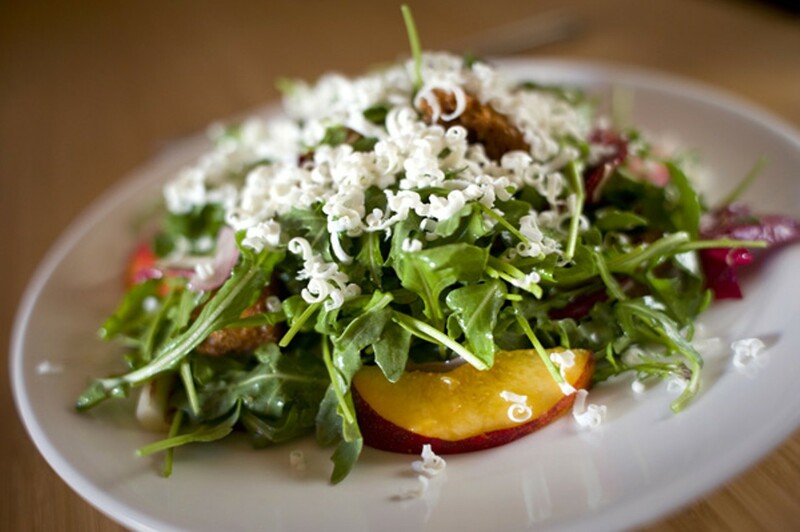 A primary reason so much of their food tastes so good is the seasonal ingredients they source from local organic and sustainable farms, dairies, and ranches like Devil's Gulch, Star Route, Prather Ranch, and Riverdog Farms. Most importantly, Thornton and his team know how to turn top-shelf raw ingredients into really good food. 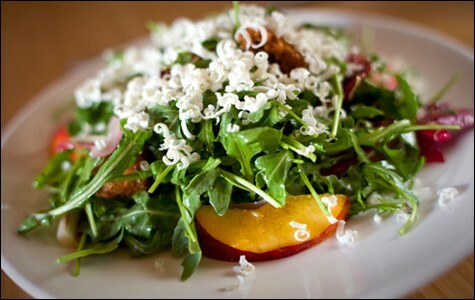 In one palate-cleansing salad, for instance, the peppery zap of wild arugula was beautifully complemented by ripe, sweet nectarines, pungent red onion, and bitter radicchio, with a sprinkle of puckery ricotta salata adding a creamy contrapunto. Another starter accented tender, smoky calamari with chunks of supple avocado, a handful of fresh garbanzo beans, a drizzle of lemony dressing, and a hint of paprika-esque powdered chili from Italy's Basilicata region. Bright green Romano beans were served hot and crunchy with a bracing mint-onion-breadcrumb salsa, and unexciting diced-and-fried potatoes got a welcome jolt from Calabrian chili peppers and pickled cabbage. Locanda da Eva's kitchen crew not only knows how to cook up the produce, they make their own charcuterie, pastas, and pizzas. The air-dried beef bresaola was superb: chewy, brick red, and rich with tangy, spicy flavor. The house terrine of coarsely ground pork, herbs, and spices was crumbly and savory and yummy on rounds of toasted Acme sourdough with a dollop of brown mustard. The twisted tubular pasta known as strozzapreti had a rustic, hand-rolled quality evocative of that Roman trattoria, and was especially satisfying all mixed up with sweet tomatoes, peppery lamb sausage, and bits of roasted eggplant. Our pizza, one of four offered, wasn't as tasty as everything else on the menu; thin-crusted and under-topped with kale, mozzarella, and crescenza cheeses, and gooey bits of lardo (cured pig fat), it was surprisingly bland and unmemorable. Happily, there were two excellent entrées on the horizon. Saltimbocca is one of the simplest and dreamiest of Rome's classic dishes, and Locanda da Eva screws around with tradition to excellent effect, substituting the veal for a juicy filet of pork, draping it with the traditional prosciutto and replacing the sage with a pigmeat-friendly mostarda of juicy nectarine flesh, snarky radicchio, and plump little currants, a real taste sensation. And the chicken-ricotta meatballs were delectable: creamy in texture with a hint of Southwestern cumin for zip, served on a bed of earthy braised kale, and sprinkled with sharp, nutty grana padano cheese. All the desserts were imaginative and satisfying, but what you might call the Reese's platter was especially yummy: dense, buttery peanut butter/chocolate chip cookies crowned with earthy house-made peanut butter gelato, chunks of fudgy ganache, and a flavor-enhancing sprinkle of sea salt. The crostada was like a bittersweet chocolate croissant stuffed with sweet, juicy peaches and a dollop of whipped cream. The panna cotta wasn't as ethereal as it should've been, and its honey-oregano flavor infusion, while provocative, wasn't particularly successful. But the polenta torte was terrific: a luscious, lemony cornmeal cake topped with ripe-to-bursting blackberries and nectarines; a ribbon of creamy, citrusy mascarpone; and a drizzle of chamomile-infused grappa, which sounded questionable but brought the dish together magnificently. In addition to several vegetarian options (two or three house salads, a couple of meat-free pasta dishes, at least one of the four daily pizzas, and four or five vegetable side dishes), the kitchen will prepare half a dozen of its usually meaty dishes without the flesh, fish, or fowl. They'll also accommodate your dietary needs with 24 hours' notice. The wine list is brief (about three dozen bottles), but it's been carefully, even lovingly assembled by Lauriston, whose tastes run toward little-known vintages that are balanced enough to pair well with all kinds of food but have enough oomph to make them distinctive. They're also quite affordable (mostly $20-$50 per bottle). Twelve are available by the glass. (Try a flute of the Monchiero Carbone Birbét with the polenta torte.) The even briefer beer list includes Oakland's own Lucky Hand Lager and Sacramento's crisp, citrusy Odonata Saison, while the cocktail menu features several imaginative Italia-accented concoctions, like the Sorrento Cooler (rum with limoncello and amaretto) and a Manhattan crafted with rye, carpano, and prosecco. The Temezcal — tequila, mescal, and elderflower liqueur — is a noggin-slapping, sinus-clearing way to kick off a meal. I can't wait to see what they'll do with figs, pears, parsnips, and mushrooms.